Optional LED illuminates the dimensional quality of the lasered design within and safely lights up dark entryways. On/off switch to conserve replaceable battery. Choice of red, green and blue LED color. 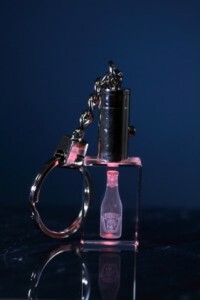 Upscale nickel plated key ring included. Vector art required for suspended imprint. Custom imprint template here. Standard packaging: Deluxe gift box. 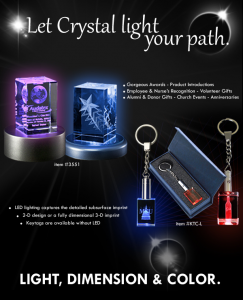 Breathtaking crystal shapes with crisp laser-etched subsurface imprint. With brilliance and purity, these crystal pieces will bring charm and sparkle wherever they are placed. Reproduce 2-dimensional or 3-dimensional designs, logos or photos in striking detail. Economical prices and low minimums to fit any budget. Choice of sizes below or contact factory for custom size quote. New! 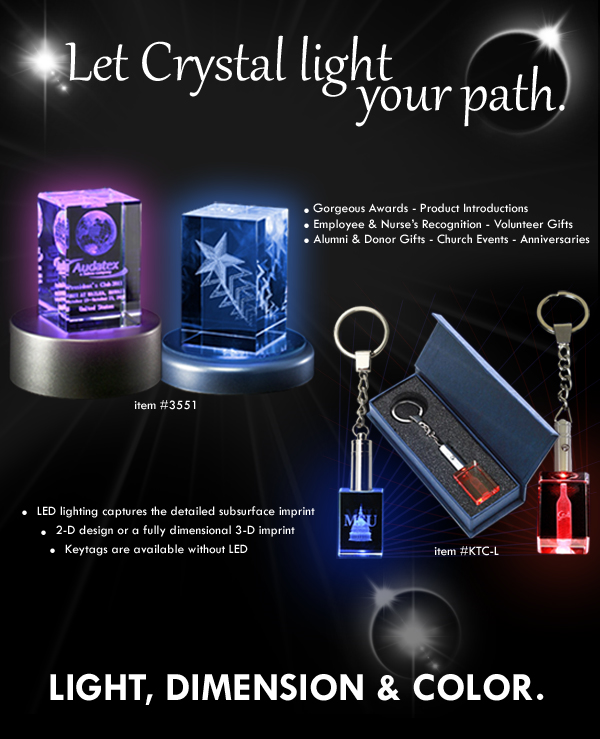 Lighted bases to enhance the design and increase the perceived value. Four different styles to fit all crystal styles. Purposes: Banking and finance, automotive dealers and car clubs, transportation, insurance and travel, restaurants and bars, women’s organizations, fashion and beverage industries, corporate gifts, sales awards, alumni and fraternal organizations. Strategy: A nationally renowned foods manufacturer needed a low-cost gift item with a high perceived value. 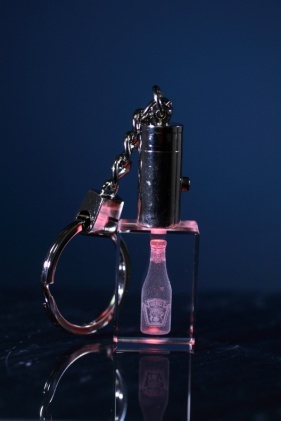 Crystal Key Tags with LED were the perfect way to highlight their core product in an elegant and eye-catching manner and show appreciation to their executive leadership and top tier clientele.